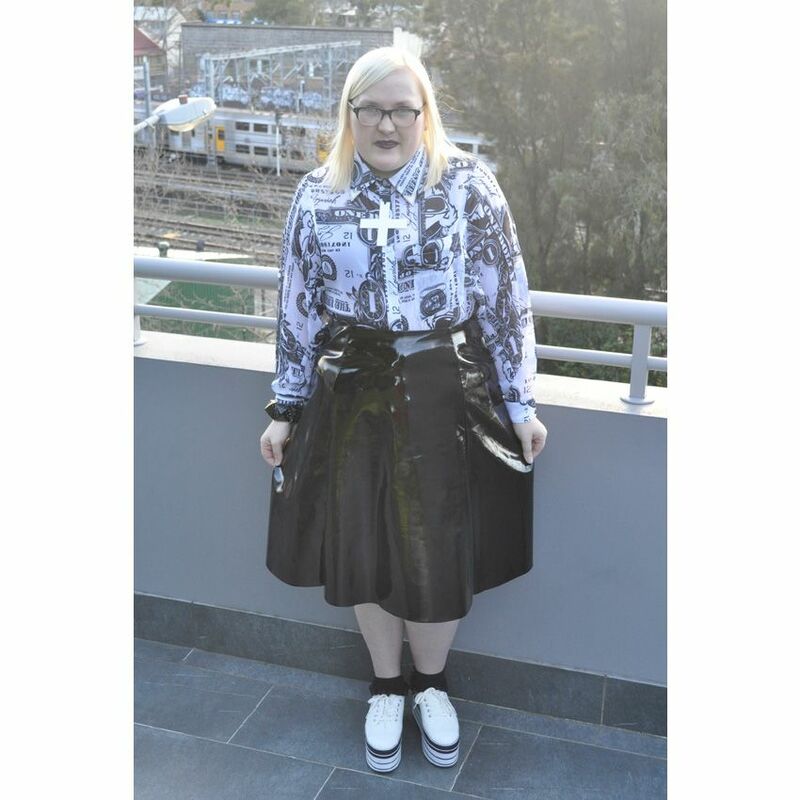 As soon as I saw this shiny plastic skirt come up on ASOS I knew I had to have it. Its everything I am into right now, shiny, a-line and with a kind of super hero x 90's vibe. I'm done with trying to wear classic pieces, not that that's what I've ever really been about, but now I can safely say I'm done with even trying to do it. Give me plastic, sparkle, boldness and novelty over classic, simple and timeless any day of the week. Absolutely love this style post! Very nice. I love that skirts texture.. I can see why people would want "staple pieces", but just sticking to that is pretty boring! Sure, the more unique items only stay on trend for awhile, but there are always new ones to replace the old, so why not re-create them and just have fun with that kind of stuff anyway? I really like holographic/iridescent looking stuff right now. I LOVE THIS! that shirt is to die for & that skirt looks great on you. To me, classics are things you'll still be wearing in 10 or 20 years time. Like that shirt you are wearing is always going to be amazing. I've got a few items in my wardrobe that I've had forever and they aren't boring LBDs. That's a better way to put it. I guess I'm just rebelling against the mag world and what I feel is Sydney style right now, I don't fit in here at all. Wonderful skirt and blouse. Loving your platform shoes, ahhhhhhhhhhhhhh, my dear Hayley you are so inspiring and lovely!!! I agree about the whole classic thing. Well for me, it's not classic.. more like, minimalist, grown up style.. whatever. That does not work for me, I just always feel so boring and not like myself. Once you go wacky, there's no going back! It's just too fun! The skirt is fantastic! Like really, holy crap, I wish they had one in a mini length. You could get the skirt and make it mini yourself? It doesn't need to be hemmed, the finish is just a straight scissor cut on it at the moment. And yes, grown up style is so so so boring. I was actually thinking that! I've added it to my saved items on Asos :) just need to save money. Have you seen the new studded leather jacket on Asos? aaah, so nice! That skirt is amazing! I think its nice to get classic staples if you have the kind of job where you need more consersative wear or just have a more conservative style, but I much prefer to splurge on something that speaks to me and my slightly off beat style. Also, I adore everything about this look and this just tells me once again that I need that mac cyber lipstick. 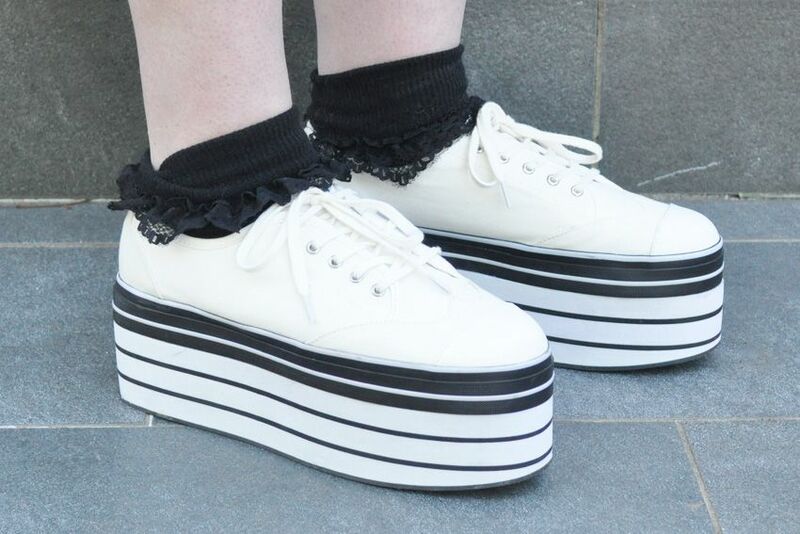 btw the asos flatforms, don't they hurt? I also have them and they hurt so much :( can't really wear them for long.. I love how this combination really emphasizes your small waist. How do you go with ASOS sizing? Do you order your normal size or go one bigger? I have ordered from ASOS once before, but definitely had the sizing wrong. I used their measurements as a guide, which meant I ordered 1-2 sizes bigger than normal. Guh, this outfit = amazing!